We are pleased to release the 2011 edition of our Report Card, an annual Fairmont Private Schools tradition highlighting student, faculty, and staff achievement throughout the past year. Watch the trailer and/or read the full Report Card here. Fairmont will be closed for winter break from December 19 - January 2. We hope you have a wonderful time celebrating the holidays with friends and family, and we look forward to seeing you in the New Year! On Saturday, December 3, seventy-five Mable Campus students in grades 4 through 8, met at Troy High School to compete in Troy High's inaugural math competition. Over 350 students from Orange County participated in the competition. While there, students were given competition-style math problems. The Mable students earned 20 awards at the competition. Click on the Mable newsletter below for the full list of awards. In an increasingly global economy, bilingualism is a huge advantage. Speaking in Tongues, an award-winning documentary, narrates the trend towards secondary language immersion starting in preschool or kindergarten, the prime time for learning language. Join us to watch the short film and have an open discussion about the pros and cons of early childhood language immersion facilitated by language acquisition experts and Fairmont's Director of Education. Bring your children along too--language learning games & activities will be provided by Lango (our Mandarin Chinese Extra-Curricular class). The holidays are a time for family, celebrations and, of course, eating. 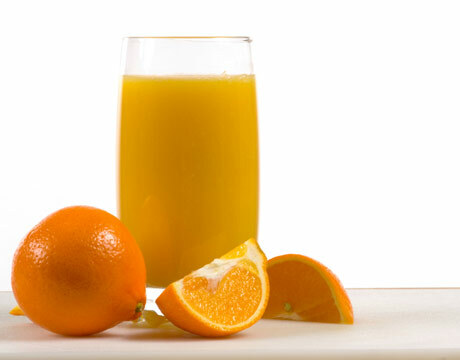 With holiday treats in abundance, overindulging can lead to tummy aches, toothaches or unwanted weight gain. Is there a way to enjoy specialty dishes without overdoing it? Yes! You can enjoy the holidays more fully if you practice mindful eating. Simply put, mindful eating is the practice of eating with increased awareness and attention to what, how, and why you eat without judgment. For example, a mindful eating practice is to notice if you are hungry even before you take your first bite. It also helps you feel your fullness sooner, resulting in less overeating. Mindfully eating slows down the eating experience allowing you to enjoy the food and your surroundings more fully. Eating mindfully can enhance the dining experience and often evokes a feeling of gratitude. 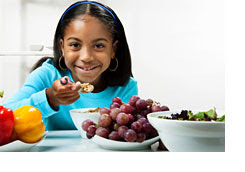 For more tips on how to encourage mindful eating, visit SuperKids Nutrition. OK, so a visit to Aquarium of the Pacific in Long Beach won't take you 20,000 leagues under the sea, but it will blow your kids' minds as they discover thousands of amazing aquatic creatures like the upside-down sea jellies now on display in the Jewels of the Pacific exhibit. Try to direct at least some of your child's screentime toward educational activities. Here's a few educational websites that keep kids entertained while boosting their math, science and reading skills: Starfall, PBS KIDS and Math Playground . I'm a big fan of Disney's Spoonful magazine for their extensive collection of kid-friendly craft ideas. Visit the website for dozens of clever winter craft ideas, like the one posted yesterday on our blog! 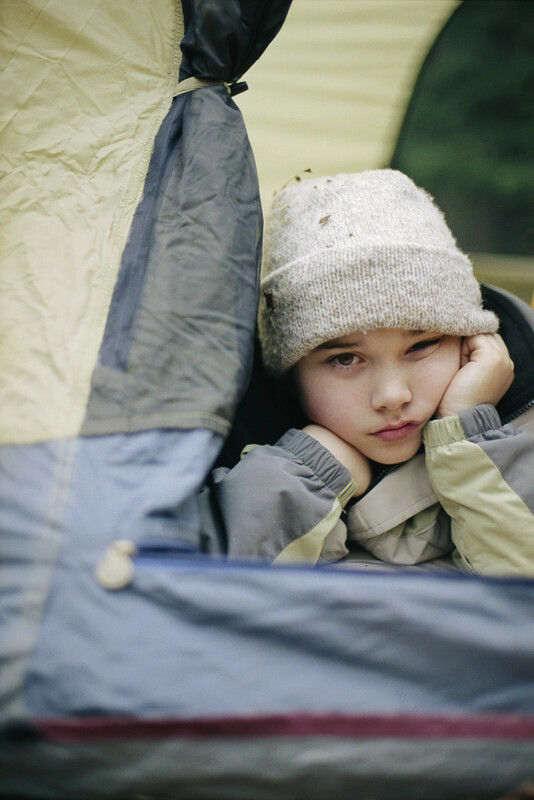 There's no reason why the chore of chronicling the holidays should always fall to us moms. Older children can create a yearly holiday scrapbook by taking and printing photos, creating page layouts, and journaling. It's a great indoor project for chilly nights and builds creative writing skills. Don't miss the Star Wars: Where Science Meets Imagination exhibit at Discovery Science Center. Boys (and little Princess Leias) will love this exhibit where kids can build and test their own speeders and robots; ride a hovercraft; see real artifacts, costumes and props from all six Star Wars films; and explore the technology of droids and landspeeders. Talk about fun learning! 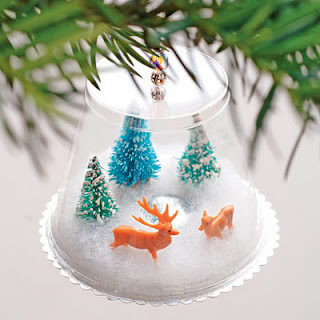 This craft owes its appeal to old fashioned snow globes which capture the imagination of old and young alike, especially during the holidays. Special thanks to Disney's FamilyFun magazine for dreaming up this whimsical winter creation. I can't wait to try it with my kids! Trace the rim of the cup onto the underside of the poster board. Cut out the circle, but stay at least 1/8 inch outside the trace line so the base will be slightly larger than the cup. Cut out a circle of batting snow that's the same diameter as the cup and set it atop the shiny side of the poster board circle. Separate or snip the batting where you'd like to position the trees, figurines, and mirror pond. Glue the base of each item to the poster board, then smooth or fluff the snow around them as needed. Sprinkle the scene with fine glitter. Use the pushpin to poke a hole in the center of the cup bottom. Thread a craft bead onto a 12-inch length of monofilament. Gather the ends together, letting the bead fall to the center of the line, and thread them up through the hole from inside the cup. String a few more beads onto the doubled line (outside the cup) and then knot the ends to form a loop. Apply a line of glue along the edge of the poster board circle. Press the cup, upside down, atop the glue and hold it in place for 20 seconds or so. During the first 10 minutes of drying time, occasionally check the seal and press down gently on the cup, if required. Let the glue cure for a full day before hanging the ornament. 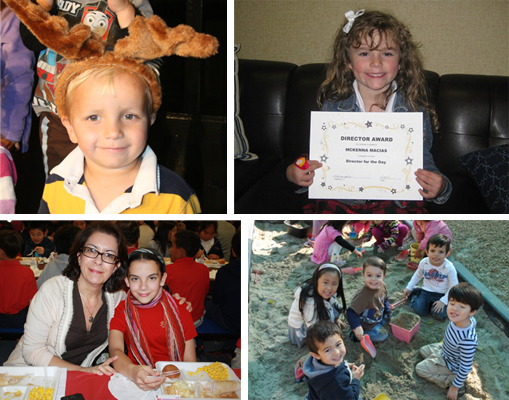 For over ten years, Fairmont Private School l has participated in the CHOC Toy Drive. Today, December 9th, 50+ Harley Davidson motorcycle riders drove on campus to collect the toys for CHOC Hospital. This was a fabulous year for the drive. The students went above and beyond and we donated over 50 boxes of toys. Each year the donations increase and it is wonderful to see the spirit of giving from our students. All donations will be delivered to CHOC Hospital so they may be given to the children there during holidays. For those children residing at the hospital, it is not just a toy. It is a ray of hope during a difficult time. See pictures from the event on Flickr. Many of our campuses hosted their annual winter musicals this week, and all the parents in attendance had a wonderful time watching the creative performances. Check your campus e-newsletter and Facebook page for links to photos and videos from the shows. On Thursday, Mable's top 4th, 5th, and 6th grade students were honored at the first trimester Honor Roll Assembly. Students receiving "A"s and "B"s in all core subjects make the distinction of Honor Roll while students receiving only "A"s are given the distinction of Director's Honor Roll. Additionally, students may not receive an "N" mark on their report card. During the first trimester, a total of 64 students were recognized for being on the Honor Roll or Director's Honor Roll. Congratulations to these students! Goodie, goodie, gumdrops...these toy picks bring me back to my childhood holidays when Christmas morning was a magical, mind-blowing occasion for me and my three siblings. 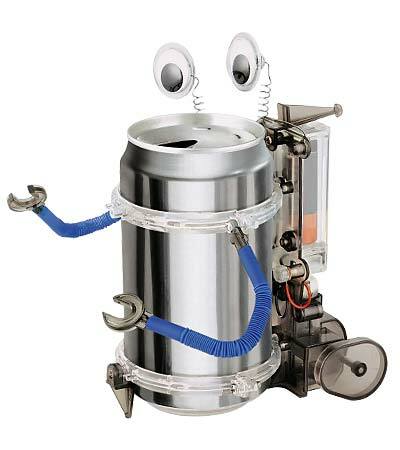 There were the toys we asked for (thanks to the brainwashing effects of Saturday morning cartoon commercials) and the true surprises--gifts we hadn't circled in catalogues or ogled on superstore shelves. Most of the time, these were the toys that stood the test of time and logged hours of playtime well into the New Year. 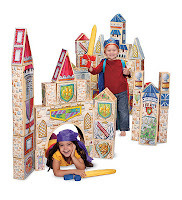 These oversized blocks offer kids the opportunity to interact with their biggest construction projects. Giant blocks are made of cardboard so they're lightweight but extremely durable to hold up to years of play. Each is printed with detailed architectural designs of European castles and buildings. Includes 48 blocks. 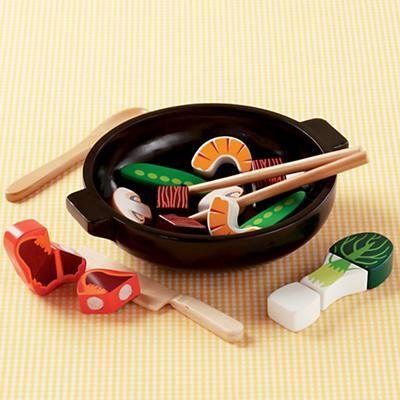 This wooden Wok and Roll stir fry set includes 3 shrimps, 3 mushrooms, meat, onions, pea pods, 1 pepper, 2 skewers, tongs, a dull wood kn ife and a spoon. It's bound to create quite a stir for the budding chef in your family. It's amazing what you can build with common items found around the house and a little imagination. This kit turns an aluminum can into a walking, wobbling, googly-eyed robot. A fun project for parents and kids to create together. 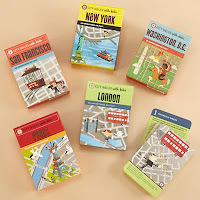 Modeled after the popular city maps for adults and adapted for kids, each City Walk set includes 50 colorful map cards and a tri-fold intro card. Perfect for discovering the cities (choose from New York, San Francisco, London, Paris and Washington D.C.) while walking the real thing or recreating a cosmopolitian tour around the house. A Dr. Toy 100 Best Children's Products Winner. 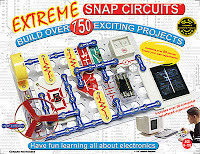 With over 750 Projects, this set includes special software that allows you to "see" the electrical signals in the circuits, just like electronics engineers do using oscilloscopes and spectrum analyzers. Kids can engineer over 750 exciting, useful electronic gadgets and play lively electronic games. Here at Fairmont, the annual holiday concerts have become a beloved tradition. The wintry decor, adorable costumes, bright lights and lovely music combine to create a magical experience for the audience. To help you make the most of your student's performance, here is the full schedule of shows along with a few concert-going tips. -Wednesday, December 7: 1st and 2nd Grade Winter Performance at 9:00 a.m. AND 6:30 p.m.
-Wednesday, December 14: 6th/JH Grade Instrumental & Ensemble Winter Concert at 9:00 a.m. AND 6:30 p.m.
Read the Fine Print. 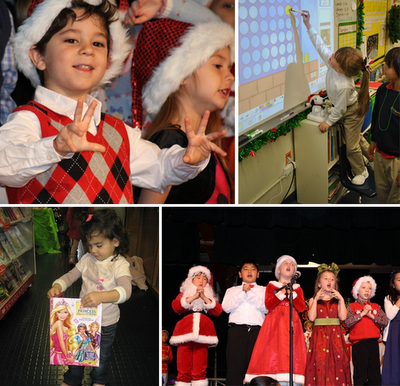 Many of the holiday shows have multiple performances to accommodate all the parents. Read the details in your campus e-newsletter and be sure to attend the right performance. Know Where to Sit. In advance of the concert, take your child into the MPR and ask him or her to show you where he or she stands during the show so you know the best place to sit to capture that perfect picture or video. Arrive Early. Parking and seating may be limited, so leave yourself some extra time to settle in and mingle with other parents. Charge Up. Camera and video camera batteries seem destined to run out at the most inopportune moments. Don't risk it...charge up the night before and bring back-ups. Enjoy the Moment. It can be tempting to stay behind the camera the entire performance to capture every second of cuteness, but we recommend you snap a couple great pics and then put down the camera to truly take in the show. Kids and snowmen go together like hot chocolate and mini marshmallows. I'm not sure what it is? I've had the opportunity to make a snowman a few times, as an adult, and it wasn't much fun. It's cold, hard work. And my snowmen were generally disappointing in both stature and symmetry, compared to the Frostyesque image in my mind. But for a child, if there's snow, there's a snowman to be made. 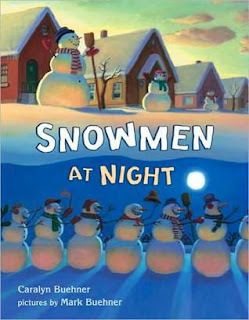 My children love the snowmen who come to life in Caralyn Buehner's Snowmen at Night. The book attempts to solve the mystery of why snowmen never look quite the same day to day. Could it be that some funny business is going on at night? Yes, indeed. Kids love hearing about all the fun the snowmen have at night--ice skating, sledding, playing baseball--even "drinking cups of ice cold cocoa made by snowman mothers." You won't regret purchasing this book or checking it out from your local library. It's a delightful read-aloud and even engages the imaginations of older kids. Just like The Grinch Who Stole Christmas and The Polar Express, Snowmen at Night deserves a spot on your holiday bookshelf. The spirit of the holiday season is underway and our Annual Toy Drive kicked off this week. We would appreciate if you could help us by donating a toy for a boy or a girl who is in CHOC - Children's Hospital of Orange County. These children would truly benefit from receiving a special gift on Christmas morning and all year long. You can drop your donation off at the campus now until December 9th. The toys will be picked up at school by the Orange Coast Harley Davidson's Chapter. They will come to the campuses on Friday, December 9th via motorcycles. Thank you in advance for your kindness and generosity. Check out these gift tips and read the history of the toy drive. 'Tis the season to be jolly! 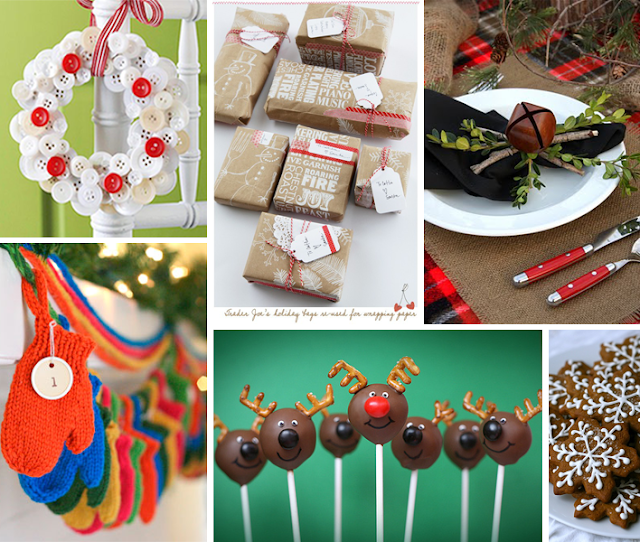 Ring in the holidays with these festive crafts, decor and treats.